Credit cards are stored by customer. A customer can have multiple credit cards on file, all credit cards can be used for transactions, unless those credit cards are blocked or expired. New credit cards can be setup from the Customer Card by selecting the “New Credit Card” action. The minimum information required to enter a new credit card is displayed on the page. 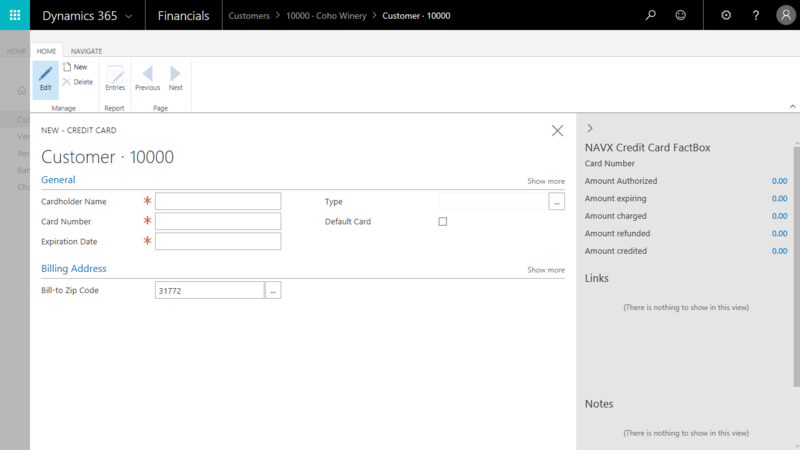 The actual credit card number is never stored in Microsoft Dynamics 365 Business Central. Only a token, a unique identifier for this credit card, is stored. Once the token is generated, the credit card number is masked.